With warm weather travel season just around the corner, tourists will soon be heading to the Smokies in droves again. If you love the Great Smoky Mountains National Park as I do but want to avoid the crowds, skip the Newfound Gap Road and yes, even Cades Cove, and check out some of the less traveled back roads of the park. One of my recommended road trips is featured in Blue Ridge Country this month. Check out my new article “The Smokies You Haven’t Seen” for a tour of the park’s southwestern border. 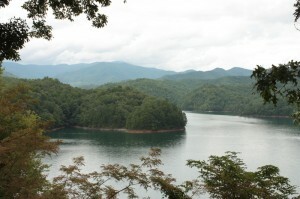 In addition to enjoying scenic glimpses of Fontana Lake, formed by the highest concrete dam east of the Rockies, a quiet stroll for your car along the trickling waters of Parsons Branch, and some of the loveliest views of the Smokies from the Foothills Parkway, you’ll also have the chance to drive the “Tail of the Dragon,” one of the curviest sections of road east of the Mississippi ever to make two or four tires squeal. I recommend you check it out with two wheels, however…if you’ve got the bike. 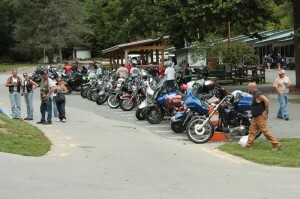 You’ll definitely get funny looks pulling into the Deals Gap Motorcycle Resort in a Mercedes….